Since we are selling call and put options we know there are traders or market makers who are buying them. In this article we will explore why only about 10% of all call options are actually exercised by the option holders even when the holders want to own the underlying shares. Why are call options purchased? The main reason for buying call options is to take advantage of share appreciation of the underlying security. Options cost less than do the shares and so options can be leveraged to result in a higher percentage return. Because of the time value erosion of options (Theta), the expectation of call option buyers is that Delta (rise in share price) will overcome the negative impact of Theta (from the call buyer’s perspective) resulting in a significant profit. Another reason portfolio managers buy call options is to move to a Delta-neutral position to mitigate “market risk” If a portfolio is short stock we have negative Deltas. Buying call options (positive Deltas) will move to a more Delta-neutral position. Finally, call buyers may actually want to own the underlying shares. In this circumstance it usually still does not make sense to exercise. Let’s explore why. The bid column shows that the options can be sold at $3.40. Then stock shares can be purchased at the market price of $77.43 resulting in a debit of $74.03, less than the $75.00 in choice #1. The option holder benefits by $97.00 per contract by not exercising the options. This is because exercise will leave time value on the table, capturing only the intrinsic value of the option premiums. Many option traders believe in the myth that 70 – 90% of all options expire worthless. This is not true. More accurately, only about 10% are actually exercised, 70% are closed while about 20% expire worthless. This article reflects one of the reasons why in-the-money call options are not routinely exercised. ***Thanks to Jason L. for inspiring this article. Registration link found on the mid-left side of the page after clicking here. We will be hosting 6 webinars per year. Saturday morning 3-hour workshop at the Plainview Holiday Inn. I am the only speaker and plan an information-packed presentation covering 5 actionable ways to make money or buy a stock at a discount using both call and put options. We will also evaluate the stocks you currently own for option-selling. For the week, the S&P 500 rose by 1.19% for a year-to-date return of +5.91%. The charts continue to point to a slightly bullish outlook. In the past six months the S&P 500 rose by 6% while the VIX declined by 16%. This week’s Weekly Stock Screen And Watch List has been uploaded to The Blue Collar Investor Premium Member site and is available for download in the “Reports” section. Look for the report dated 09/23/16. On page 351 of your Encyclopedia (1st one) you suggest using an extremely deep in the money leap for a stock replacement. Why go so far deep in the money when we can pay less for one closer to the stock price? Thanks. 1- Deep in-the-money calls have Deltas approaching “1” and therefore most closely resemble the price movement of the underlying securities. 2- The deeper in-the-money we go, the less time value we will pay for the option and it’s important when using this strategy (stock replacement with LEAPS) to pay less time value for the long call than received from selling the short call. As options move deeper in-the-money they tend to trade near “parity” (mostly intrinsic value). Edwards Lifesciences is a provider of cutting edge heart surgery devices and minimally-invasive cardiovascular procedures. On July 26th, the company produced a stellar earnings report with an 8% EPS “beat” This resulted in raised guidance from analysts. 2016 consensus is for 25% EPS growth and 20% sales growth. 2017 consensus is for 18.6% EPS growth and 12.5% sales growth, all impressive stats. Our most recent premium Stock Watch List shows a recent price of $118.00, an IBD 50 rank at #4, a member of the “Medical” industry currently ranked “A”, a beta of 1.05. adequate open interest for near-the-money strikes and a resident on our premium running list for 11 weeks. The current technical chart is mixed with strong moving average trend as shown below. Check to see if this equity deserves a spot in your portfolio. How much do you think the election will effect the stock market? Should we stay in cash for the November contracts? I look forward to reading here as Alan and others weigh in! Yesterday I shared with some friends that in my view the market has priced in a Hillary win. I also suspected she would show up better prepared, win the debate, prompt a market rise today, a bounce in alternative energy, a drop in VIX and oil. So that is how I traded it with options yesterday at the close. None of that took Karnac to see coming but it was lucky today :)! Trump will do his homework next time, come out swinging, do better and I will trade the exact reverse of what I did yesterday along with playing a rise in gold. The better he does the more Wall Street has to unwind stock price in my opinion. If he were to be elected and the Fed raise rates in December it would be the perfect storm for another yard sale on stocks in January. Hopefully I will buy some this time! I viewed Tuesday’s market movement as a window into the thinking of the institutional investors. Without getting political, this one event appears to indicate that “market” favors a Clinton victory in November. This may simply be a commentary on the “known” versus the “unknown” as it relates to our financial markets rather than a commentary on other qualities of the candidates. There certainly is a large percentage of our population that pushes for change but also a significant percentage that is more comfortable with the status quo as it relates to the stock market and demands that change be defined in more specific terms. Right or wrong this appears to be what was signaled after what most polls indicate as a Clinton debate victory. We’re in the 7th inning of a 9 inning game so it’s too early to define our November contract decisions. There are 2 more debates and who knows what surprises lurk in the bushes? As Jay posted, the Fed will also play a role moving forward as a 25 basis point rate hike is highly likely this year…at least. That said, once these events pass, market performance will be mainly dictated by corporate profits. Alan, I have been carefully studying the stock charts every night as I always do, yet now I am uncertain whether the stocks I use would be in the best positions for doing trades. 1. The first question I need to know is for when a stock is channelling S/ways at expiry, then does the price have to be above both the EMA’s in order for me to want to do any kind of rollout? If there is no need to trade like a proper trader in which case we can buy or enter a stock anytime, then to me selling covered calls would seem a lot easier to get the hang of than many of the other strategies out there. For technical analysis, we use 4 parameters which include trend identifying, momentum (2) and volume indicators. When a stock is consolidating (moving sideways) in neutral markets, it is still eligible but stronger consideration should be given to in-the-money calls or out-of-the-money puts. In strong bull markets, even these candidates may be appropriate for out-of-the-money calls. So our decisions are based, not only on trend but also on overall market assessment and personal risk tolerance. The best way to summarize a response to your technical questions is that stocks consolidating (at support of the 20-d EMA but sideways) are still eligible and then it becomes a decision as to whether there are better candidates to choose and if not, which strike to select. The stocks that pass our premium report screens meet these technical requirements. Covered call writing gives us the flexibility to use ITM calls and OTM puts when we have mixed technical pictures. How often do you evaluate your stocks to see how they are performing (Price vs Basis, 20d-ema, MACD, Stoch)? I purchased stocks & sold options Wed of last week. Monday they were under their 20d-ema and the other indicators were headed down. Today they were all back up. Not sure how often to evaluate & when to pull the trigger on getting out. I check daily but much of position management can be automated. In my books/DVDs I discuss the 20/10% guidelines to deal with declining stock values. The short call must be closed first before any other position management maneuvers. Once we enter a position we can set a limit order to buy back the option. Let’s say we sold an option for $2. We immediately set up a good-til-cancelled order to buy-to-close at $0.40 or less. Change to $0.20 or less mid-contract. Ask for email notification if trades are executed. Then decide to sell another option or sell the stock. I’m a new member of BCI. In the money covered calls are interesting to me. I’m wondering, why would someone buy an in the money covered call option? Covered call option: $6 for 20 strike price. Question: Why would someone buy the call option and when would you expect them to exercise it? The reason in-the-money options are purchased is usually to leverage the lower cost of options compared to stock. In this example, 100 shares can be controlled for $600.00 instead of $2500.00. Deep in-the-money strikes like this $20.00 strike have Deltas approaching “1” and therefore closely resemble stock price movement. Once share price moves above $26.00 the option buyer starts making money. If price moves to $28.00 there is a $2.00 profit on a cost basis of $6.00. The most likely time for exercise is the Saturday after expiration Friday as long as time value remains on the premium. Dividend ex-dates may result in early exercise. 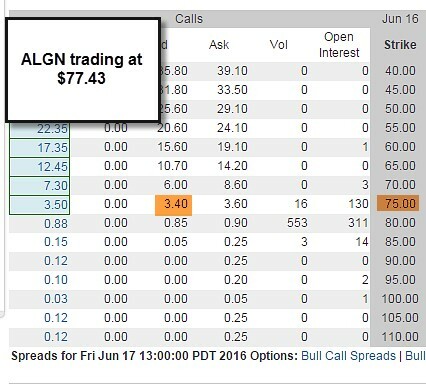 If I may build on Alan’s reply I buy options frequently for speculation always ITM. It helps mitigate time decay. I have no intention of exercising any of them! If I wanted the stock I would sell a cash secured OTM put or just buy it. I am betting upside without spending much. I suspect many option buyers are like me. The only real exercise fear you have selling ITM covered calls beyond dividend risk is your broker once term expires. They will always grab your stock at a discount for their inventory if still ITM! Although this parameter is currently not available to the public, my team has been receiving these stats from the developers of this algorithm and including them in the Premium Stock Reports. The higher the number, the more likely the stock is to outperform the market over the next 6 months and with the least amount of volatility. I have tested the best level to require over several years and with hundreds of securities. The BCI methodology requires a ranking of “5” or better. Since our methodology uses multiple screens, non-members will still generate a quality watch list of eligible option-selling candidates using all our other screens. Our second Blue Hour webinar will be held tomorrow. There are 8 seats remaining. Premium members can register for free after logging into the member site. General members can purchase a seat (space-permitting) from the store link at the top of this page. Thanks Alan for those replies, and it’s great to know that I don’t need to wait for the stock to pullback to a support area before buying. I’ll definitely need to change my way of thinking on that one, as it is different from how I have learnt to enter a trade. 2. If buying a new stock in the middle of the contract(not from an exit strategy), then would you suggest the strike always be ITM one? 4. And when my stocks are falling in price, wouldn’t it preferably be easier to mitigate losses if weekly options had been sold, rather than the monthly options you prefer us to use? The 2 momentum indicators are important but only pieces of the puzzle. Stocks with mixed technicals are still eligible but I tend to favor in-the-money strikes in these situations. 2- Yes, with the exception of a strong bull market environment when I would still consider OTM. 3- Not sure I fully understand this one but if you are asking about avoiding early exercise look to see if there is any time value remaining on the option. If yes, early exercise is possible but unlikely. Also, make sure there is no ex-dividend date prior to contract expiration. 4- I find it much more practical to use position management techniques in a 1-month time frame. In the 1-week time frame Theta is causing time value to approach zero and there is little we can do to capture additional time value. However, I do believe that good returns can still be accomplished with Weeklys. My personal preference remains Monthlys. Thanks for some great answers, and I will no longer need to be put off buying any stock which may happen to show divergences from the price.